This morning we got up early because hubby had a meeting to attend in Macon. That means I was left to my own devices...LOL. I am working on some recipes and decided I needed to start the morning by making a nice big brunch to last me until dinner time. So, I baked for a while this morning and then took a break mid-morning to make myself brunch. I decided to make a big breakfast burrito. I made a quick grain-free tortilla/wrap that only takes a couple of minutes. Even though its thin, it is sturdy and holds a lot of stuff. 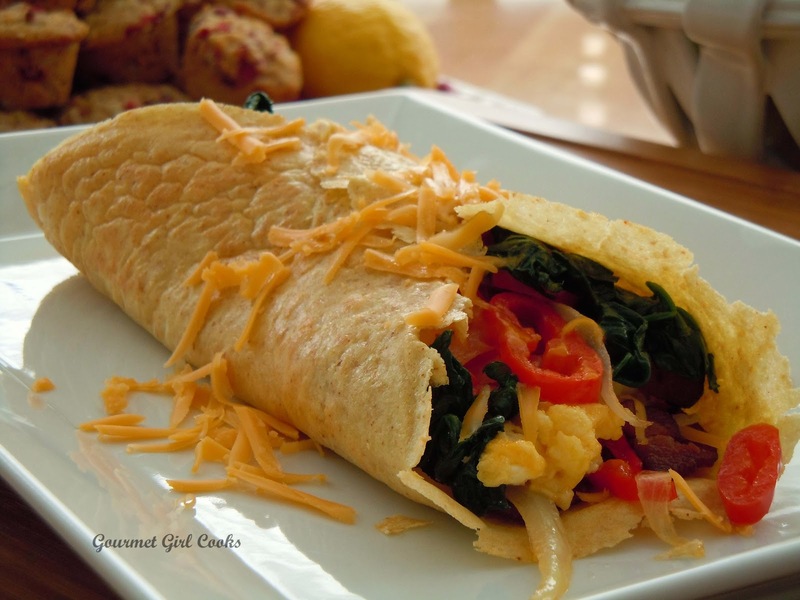 I filled my tortilla with a couple of scrambled organic eggs with cheddar cheese and oven roasted nitrite-free bacon. 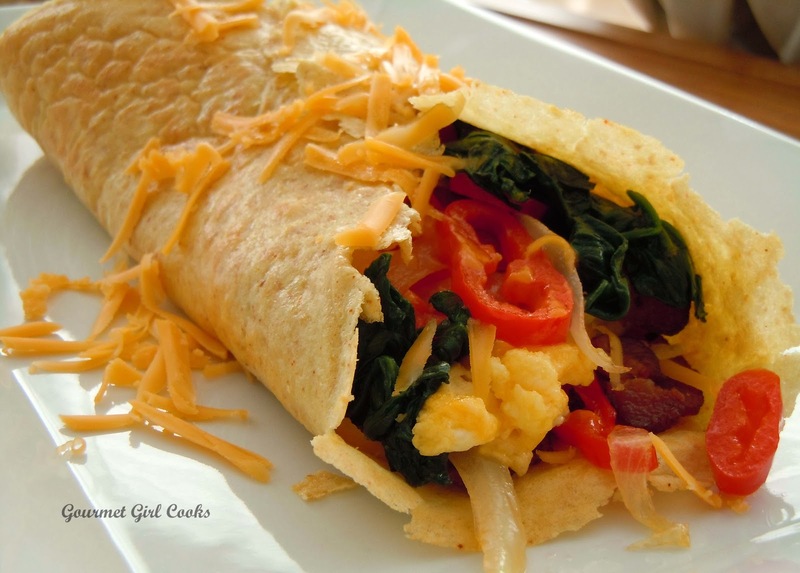 I did a quick and light saute of some sliced red peppers, onions and a little sauteed baby spinach and rolled it all up into a big fat breakfast tortilla. Besides being delicious, it is wheat free, grain free and low carb...it doesn't get much better than that! I snapped a few photos for you to see below. Enjoy! Whisk all ingredients together in a small bowl to form a smooth, thin batter. Lightly spray a 10-inch non-stick skillet with olive oil spray and heat over medium-high heat. Pour batter into hot skillet, tilting the pan and using a circular motion to evenly distribute the batter in the bottom. Cook for 1 to 2 minutes until very lightly browned and cooked around edges. Carefully loosen and flip using a rubber spatula; cook for another 1 to 2 minutes. Serve and fill with your favorite fixings. 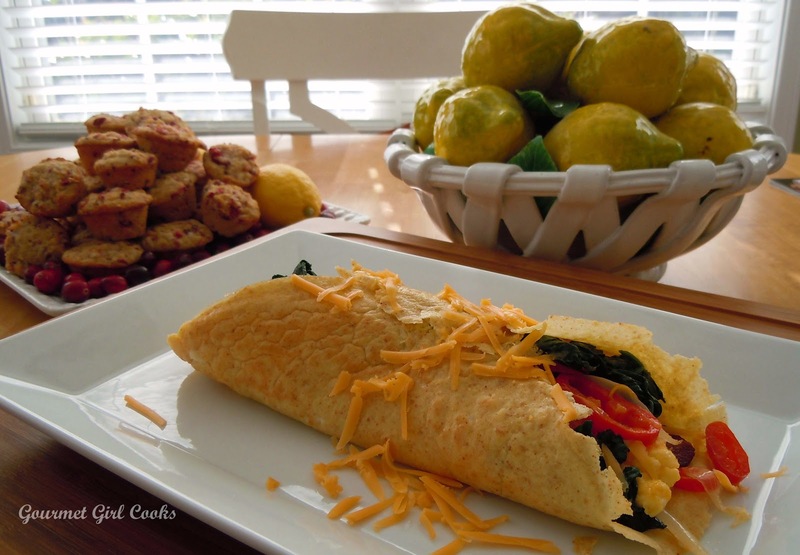 *Note: To make 4 tortillas, use the following amounts: 1 cup egg whites/egg substitute, 1/2 cup blanched almond flour, 2 tablespoons plus 2 teaspoon of ground golden flax, 4 teaspoons finely grated Parmesan, 1/4 teaspoon salt and 1/4 teaspoon seasoning (or to taste). Pour approximately 1/4 cup of batter in hot skillet to make each tortilla. I just wanted to say thank you for sharing this recipe. This is my favorite GF tortilla,(I've made several different kinds)and now I make these all the time. and feel smug about how healthy your vessels must be! Hi, do you have any advice on making these ahead of time and storing them? How about reheating them? Thanks! I've been meaning to try these for weeks...kept putting it off since I've tried so many wrap recipes that didn't work over the years. OMG These work great! They hold up, don't get soggy or fall apart and taste terrific! What more could I ask for in a wrap? Nothing! I'm going to make a bunch to put in the freezer! Thanks for creating these. Have you tried making these without the Parmesan? I am also dairy free and am trying to find a way to eat my beloved Mexican food! This was so good wrapped around my hot dogs today. I left out the parm and it was just fine. I jotted this one down as my go to wrap. Thanks for sharing!